The full-size heart model was created in Jefferson ID’s Design Technology Lab. 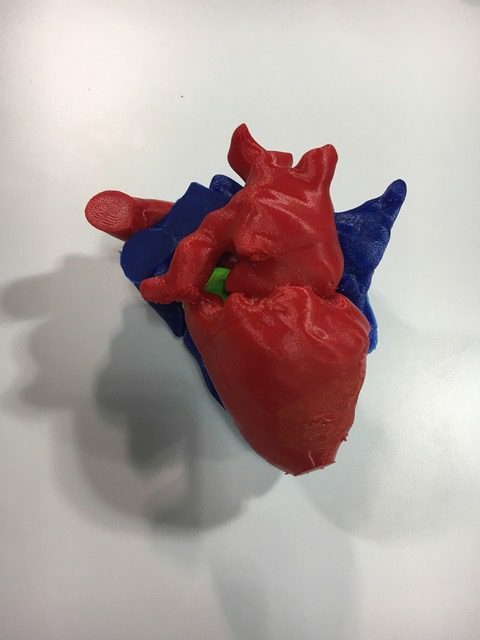 Jefferson Industrial Design Senior Jackson Gordon recently helped a Thomas Jefferson University Hospital surgeon by 3D printing a model of a patient’s heart. When Dr. Vakhtang Tchantchaleishvili was faced with a difficult and complex surgery, he collaborated with Jefferson ID to create a model of the patient’s heart as a visual aid prior to the procedure. Jefferson’s ID program features a Design Technology Lab dedicated to prototyping and experimentation. Students are encouraged to integrate technology into their design processes. The lab has an array of 3D printers that provide a range of resolutions and is also outfitted with Wacom tablets that students use for advanced rendering and other digital work. This entry was posted in ID – Undergraduate Program, Legacy Posts, MSID - Graduate Program. Bookmark the permalink.